With more than 100 laboratories and research centres, PSL has 2,500 researchers, among them the most distinguished (11 Nobel Prizes, 10 Fields Medals, 28 CNRS Gold Medals), as well as a strong student community at Master’s and Doctorate levels (approximately 70%, including 1800 doctoral students). Inheriting a long tradition of innovation, PSL has a strong research potential and an ambitious scientific strategy consistent with the most demanding standards of the major international research universities. One of PSL’s missions is to transform French scientific potential into an engine of innovation and economic growth. PSL institutions achieve excellent results in terms of technology and knowledge transfer, thanks to effective intellectual property management, a dynamic partnership research policy, the creation of start-ups, and the provision of expertise to companies. PSL has a comprehensive university training programme from Bachelor’s through to Doctorate, covering all disciplines, from the humanities and social sciences, from artistic creation to economics and management. Founder Members: Collège de France, Chimie ParisTech, Ecole Normale Supérieure, ESPCI ParisTech, Institut Curie, MINES ParisTech, Observatoire de Paris, Paris-Dauphine University, Association Art et Recherche, CNRS, INSERM. Associate Members: Institut Louis Bachelier, Conservatoire National Supérieur d’Art Dramatique, Conservatoire National Supérieur de Musique et de Danse de Paris, Ecole Nationale Supérieure des Arts Décoratifs, École Nationale Supérieure des Beaux-Arts, La Fémis (École Nationale Supérieure des Métiers de l’Image et du Son), Fondation Pierre-Gilles de Gennes pour la Recherche, l’IBPC-Fondation Edmond de Rothschild, Lycée Henri-IV, INRIA. 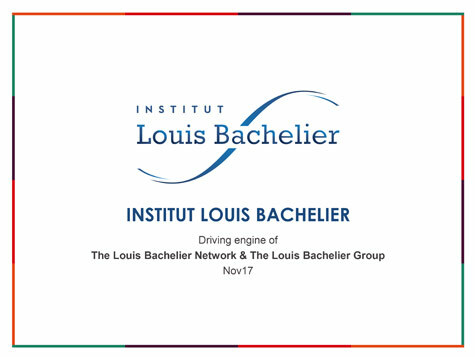 The Institut Louis Bachelier is developing, alongside PSL, provision of online courses (MOOCs). This initiative stems from the Institute’s desire to disseminate and develop its research content and is an unprecedented opportunity to create MOOCs on key innovative subjects. Two projects are currently under consideration: an introductory course on financial regulation and a course on the issues around Big Data. Combining the respective contributions of academics and professionals, these tools respond to the Institute’s ambition to forge partnerships between companies and the research community. ■ Students: PSL has 14,000 students, including 70% at Master’s or Doctorate level. ■ Research: 107 research laboratories and 2,500 researchers covering all academic disciplines, including 12 Laboratories of Excellence and 8 Equipment of Excellence. ■ International: Each year, PSL welcomes more than 200 foreign professors, as well as 900 foreign students, doctoral candidates and post-docs. ■ Distinctions: PSL researchers have been awarded 10 Nobel Prize in Physics, 5 Nobel Prizes for Chemistry, 2 Nobel Prizes for Medicine, 1 Nobel Prize for Economics, 10 Fields Medals, and half of all CNRS Gold Medals (the highest French scientific distinction). ■ Documentation: PSL possesses a documentary collection that is unmatched in Europe for an institution of this size, with more than 3 million documents at its 18 sites in Paris.